I won’t lie, I’ve always somewhat ironically been hyped for Persona 4: Dancing All Night, the rhythm-action spin off to one of the greatest JRPGs. On the one hand, I very seriously enjoy the music of Persona 4, on the other hand, images of waifus dancing on the screen to poppy or even dubstep inspired tracks meant that I was prepared for this game to be entirely awful, and yet I’d play it, with a smile on my face, forcing my friends to endure the game with me. It was supposed to be me torturing them with something they’d hate, essentially. 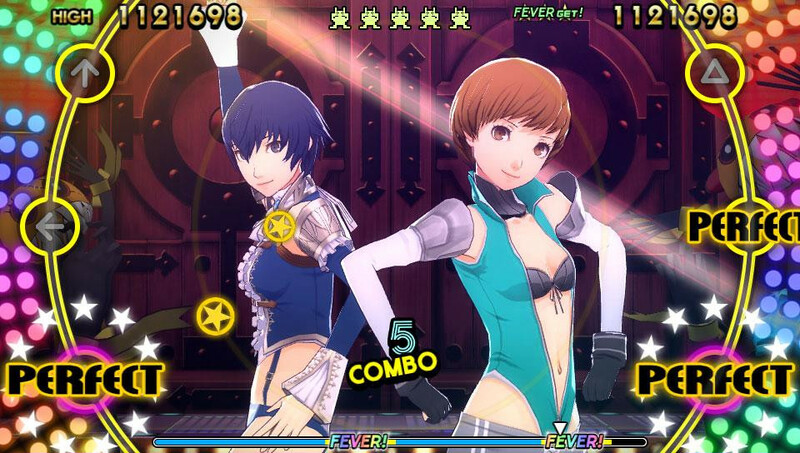 Well, Persona 4: Dancing All Night absolutely ruined that for me by being one of the best games I’ve played all year. I wanted to sit there, rub it in my friends’ faces, force them to play it and laugh at their misery. Instead, I don’t actually care whether they’re enjoying it or not, I love it. 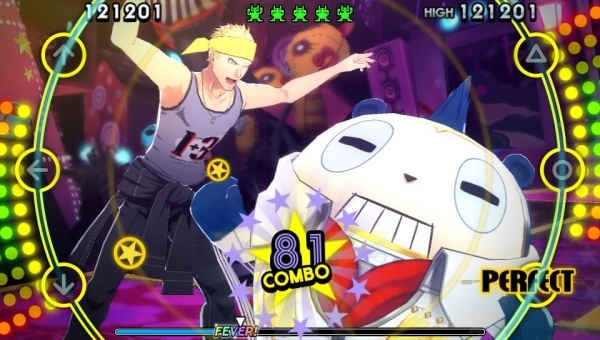 So Persona 4: Dancing All Night, otherwise known as Game Of The Year 2015, is a rhythm-action game where you simply press one of six buttons (seven, if you include the odd flick of the stick) in time with the music to make your character perform perfectly choreographed dance moves. It’s hardly an inspired or new idea, but I’m completely enraptured by it. As I said, I’ve always loved the funky tunes of Persona 4, but I never imagined enjoying a game like this as much as I do. So in gameplay we use three D-Pad buttons, Up, Left and Down and three face buttons, Triangle, Circle and Cross, with moving one of either control sticks simulating a record “scratch”. There are four types of notes, standard single-press notes, Unison notes which will require you to mirror your thumb motion and hit a button on both sides of the pad, Hold notes which you hold for the required amount of time and Scratch notes, which you hit by flicking either stick in any direction. In the earlier modes, these notes will come at you slowly, giving you plenty of time to adjust to the song’s beat and before you know it your thumbs will navigate the controls effortlessly. It started out slow – I had a few plays on Easy, quickly followed by Medium as I needed more of a challenge. Simple stuff, honestly – I rarely struggled to tap along with the beat of the music and consistently got a ranking of “BRILLIANT!!”. It wasn’t long until I had cleared all of the songs the game offers in Medium and moved onto Hard mode – which really is worlds apart. Hard mode barrages you with notes, harder and faster than you’re prepared for, and failing a whole song only requires two full seconds of missing notes. Honestly, this early interaction with the game’s second toughest difficulty majorly put me off playing – until determination set in. The experience of playing Persona 4: Dancing All Night is a bit of an odd one, because I’ve already praised the gorgeous visuals and use of color, but to be honest, it’s all filler. When I play this game I don’t know what dance moves my character is doing, I’m 100% focused on hitting every note on the screen with as much accuracy as I can possibly muster. Honestly, so much of so many of the dances are a complete blur, even though I’ve played through the respective songs at least three times, if not more. But of course, this is a rhythm action game – what the dances look like may not be memorable, but the soundtrack is near constantly playing in my head, even right now. I’ve sat back and watched friends play the game, and even then it’s a struggle to force myself to look away from the addictive note-patterns and just look at the characters dancing away on screen. Visually, it’s all lovely, smooth animation, with the high-point-earning Fever mode introducing a second character to dance with – that is if you’re doing well enough, of course! Clearing stages is decided by an “audience”, represented by five little monster icons on the top of the screen. If they’re flashing and dancing, then you’re doing well! If they look bored or even angry, consider yourself the owner of two-left-feet. In case you can’t tell from what I’ve written thus far – I really, really, like this game, and I haven’t even mentioned waifus properly yet. Yes, we have the usual Persona 4 cast and there’s a brand new storyline too – basically, people watching a hidden video at midnight on the Love Meets Bonds festival website are being taken to a mysterious world – or being put into a coma. The P4 crew just so happen to be attending LMB, so when trouble strikes they’re there to follow their pals in the other world and save the day. The entire story is basically played out in long conversations, split up by the occasional dance routine – essentially a long, but voiced, visual novel. I don’t dislike the story, by any means, but it feels like a major afterthought to the rest of the game. And that’s fine, honestly! I was having so much fun with Free Dance that the story could’ve been entirely absent and I would not have complained in the slightest – the context as to why our familiar heroes are dancing for their lives is appreciated, though not necessary. 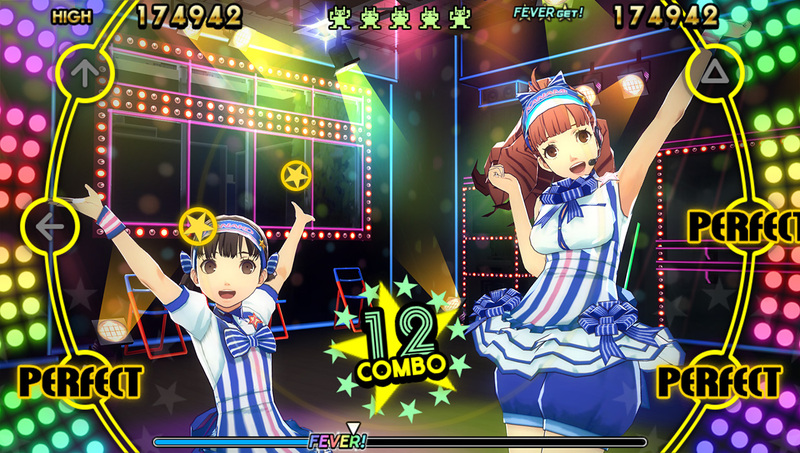 So, to summarize, Persona 4: Dancing All Night is quite possibly the best rhythm action game I’ve ever played. Not since the hey-day of Guitar Hero have I been so entranced, enraptured, entirely captivated by icons moving in time to music. I genuinely love it – to the point where, whenever the inevitable DLC is released, I’ll likely buy any new tracks. I want more music, I want more dances, I just want more more more of this game. If you like Persona 4’s OST or rhythm action games, buy this. This is likely to be the very last great game on the Playstation Vita – and what a game it is.